Creating a membership is mandatory,because adverts can be posted only under a particular membership.Unlimited memberships can be created as per your requirement. - Select Components => Jom Classifieds => Memberships => New. Now you should see the following form. Name Name of your membership. Description Describe about your membership scheme. Membership Expires On Set maximum lifetime for your membership. Set 0 [zero], for unlimited days. Ad-Life time Set maximum lifetime for adverts, under this membership. Set 0 [zero], for unlimited days. [Note: Ad-life time must be within the membership's lifetime]. Number of Adverts Set maximum number of ads, that can be posted under this membership. Price Set price of your membership. [Note: Only one free membership can be kept]. Published Select whether your membership should be published or not. Promotion class suffix Optional CSS class added to each advert's container element of this promotion. You can use this option to customize the look of the adverts related to this promotion. - That's it. Save the form. 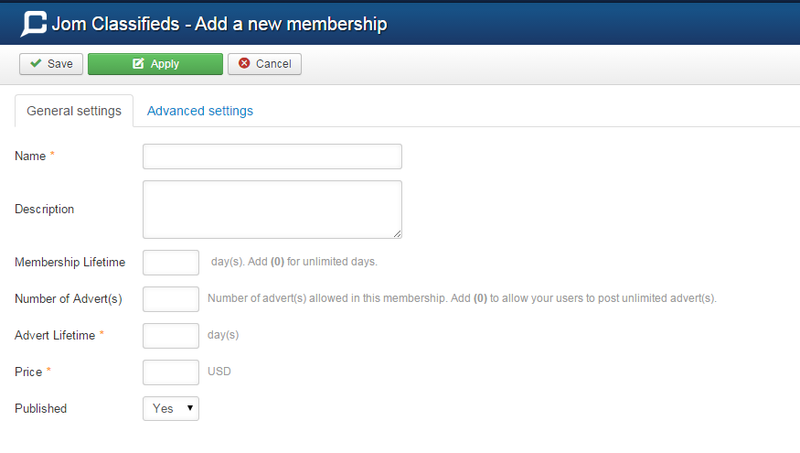 You have successfully added a membership .You can also edit the above fields by using Edit option.